Long-distance cargo transportation demands tyre mileage and safety. SMART-ENDURANCE technology extends tyre life due to higher durability of tread, safe carcass and possibility of multiple regrooving and recapping. A special SMART-ENDURANCE rubber compound with active carbon-polymer interaction centers strengthens bonds between soot and rubber and improves tyre durability. The tyre carcass forms the fundament of a tyre. A new generation of tyre carcasses Cordiant Professional repeatedly prolongs tyre life because of a unique tyre section in combination with highstrength metal cord type: first by deepening the tyre tread – regrooving – and then by recapping. So, the tyre mileage increases significantly. A new formulation of breaker compound reduces heat production and ensures reliable connection between the rubber and breaker metal cord. Reliable structure of the breaker strip enhances protection of the tyre carcass and significantly improves tyre durability. Roads are not always ideal. This is why tyres need to be resistant to damage. The innovative STONE-SHIELD technology was developed specially for treacherous driving conditions. It protects tread patterns from stones and prevents damage to breaker layers. A special sequence of unique three-dimensional stone extruders in tyre grooves protects the tyre and breaker layers effectively. The tread does not grip stones from dirt roads and irregular terrain, keeping the upper layers of the breaker undamaged. Poorly maintained roads demand a new approach to tyre development. Only Cordiant Professional line has special STONE-SHIELD extruders in all tyres: steering, driving and trailer ones. This option is unique, even among premium tyres. Self-cleaning improvements due to the difference of deformation between tread blocks and cone-shaped protuberances at the bottom of the tread groove when the tyre is running. The tread does not grip stones and cleanses itself from mud, which improves traction. Effective business needs high efficiency, and tyres are often exposed to overloads. STEEL-DEFENCE technology strengthens the tyre bead, making reliable and safe transportation possible. The combination of reliable bead structure and excellent tyre adhesion allows transportation companies to fulfill profitable contracts and transport cargo over any distance. An enhanced U-scheme of bead with STEEL-DEFENCE technology. A high-tensile chafer strip with metal cord strengthens the bead zone and increases the safety in complicated conditions. A new optimized tyre section fits the purpose of every tyre. 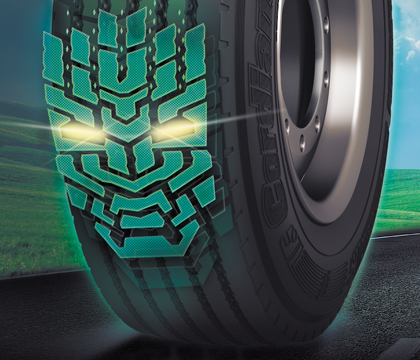 It minimizes tyre deformation in traffic, lessens overheating under pressure and ensures a great strength margin of the carcass. 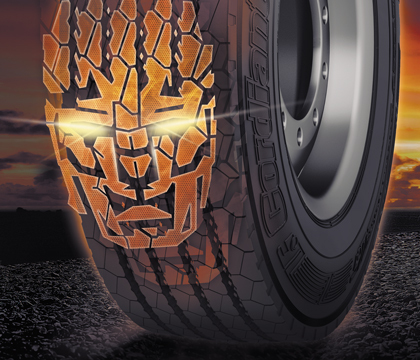 You can use these tyres on any type of road without having to worry about the structural integrity. A bead ring with a hexagonal shape provides a perfect fit, ensuring a hermetic seal of the whole structure during operation.